There I was, up the Petrohué River. Luckily I had a paddle, however much good it did me. You see, last week found me white-water rafting in Chile. 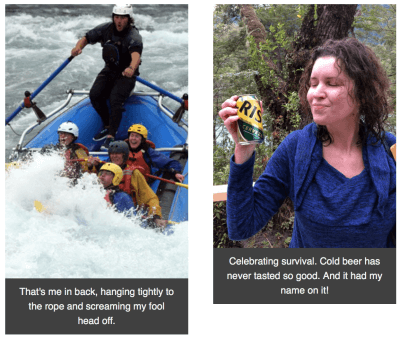 Am I a white-water rafting kind of girl? Absolutely not. I was terrified when we signed up for this thing. I was terrified as we drove to the river in the van. I was really terrified when we received the complicated safety lesson. Why did I ever sign up for this thing? Because I’m a firm believer in using fear as a remedy against feeling stuck. Whenever I find myself going in circles over a creative project, unable to take the first steps toward a dream, or striving for perfection instead of completion, I know that I’m stuck. And I’m stuck! I’ve been working on releasing a podcast series for too long now. I’ve gotten all tangled in perfection, instead of completion. Have you ever started going in circles over a project or a dream? It happens to artists all the time, an occupational hazard. Whenever I’m stuck I know it’s time to do something that scares me. Selling all my possessions, moving to France by myself, shark-diving in Cape Town…It’s always worked a treat. So I hoped that facing my fears would once again do its magic. That I could use this energy to overcome the challenge that I’m facing now. Get past my fears surrounding the podcast series so I can share it with you. This was my intent as I lowered myself into the tiny inflatable raft on Category 4 rapids in a foreign country. There was no going back now! Each time Captain yelled, FORWARD! we all rowed like the dickens. As we approached each roaring rapid, Captain ordered GET DOWN! and I assumed the crash position as I wailed for my mother. Others high-fived each time we made it through alive, but I just wanted to go home. I wasn’t the only one who was scared. But I was the only one who was still screaming like a banshee well after we’d got through the rapids. I was gritting my teeth through the whole experience, absolutely miserable. And then I saw a crow standing on a rock jutting out from the swirling water. So even though I was having what I would describe as a very bad day, I smiled. I still wasn’t feeling it to be honest, but I kept that idiotic smile pasted to my face anyway. And then suddenly, it was real. By the time we hit the next rapids the experience felt real; the stunning scenery, the relentless waves crashing over us, the teamwork, the determination, the beauty of that wild river. Because even though it was hard, even though it was scary, I was having fun. In fact, I couldn’t stop laughing. Back on land, hot empanadas and cold beer (Crista Beer!) was how I celebrated my survival. And I knew that once I got back home, I would no longer be stuck. I felt confident that I could untangle my to-do list and release the podcast this Spring. Because I learned that any challenges standing between us and our dreams can be overcome. No matter how scary. All we have to do is look each challenge in the eye and smile at it.